Can you use your visual discrimination and visual scanning skills to find and circle the five differences in this picture? 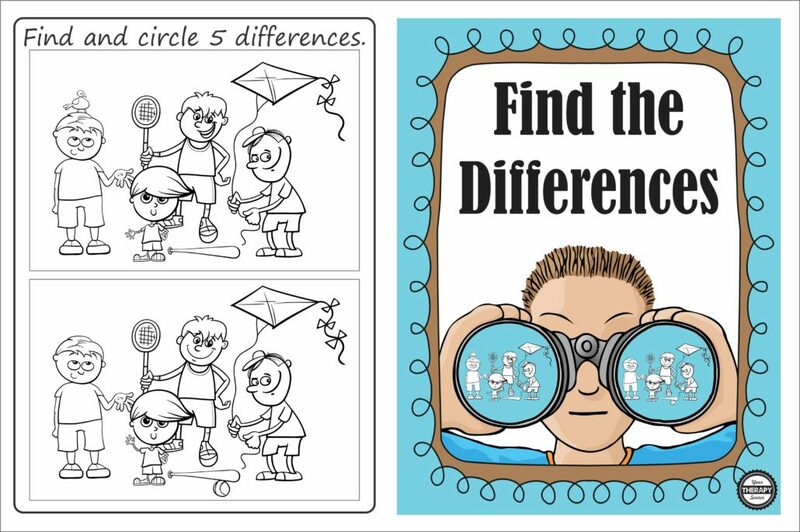 Download this freebie from the Find the Differences Packet. The best thing about this puzzle is that it is not too difficult. Some of the puzzles that are available for children to spot the differences are very hard to complete and children get frustrated. These puzzles are all in black and white and present a child with a “just right” challenge. Find out more information about the complete packet at Find the Differences. This download includes 30 find the differences puzzles and the solutions to the puzzles. Find 5 differences between the two pictures on each page. All the pages are in black and white. 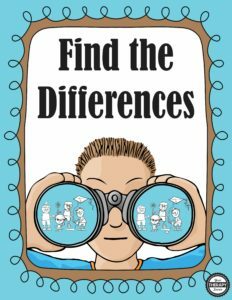 There are plenty of find the difference activities around but many are just way too difficult. This collection is easier to determine the differences between the pictures. Find the Difference encourage visual scanning, visual discrimination and visual motor skills. FIND OUT MORE.